Office Ladders Don't Have to Be BORING Anymore ! 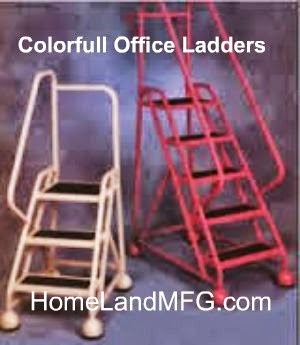 Office Ladders can be Colorful. 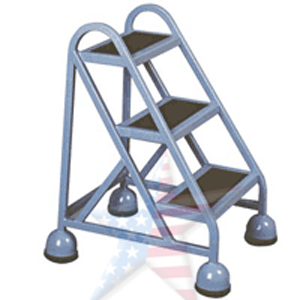 Rolling OFFICE LADDERS combine the high quality construction of our industrial and commercial ladders. 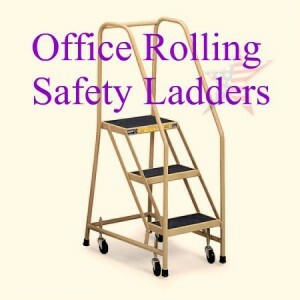 Office Ladders have an attractive design and finish that suit the office/home environment. 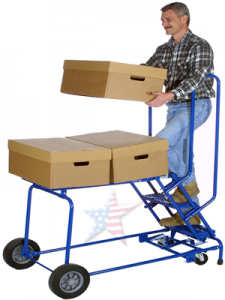 Optional features include two platform depth sizes, three handrail configurations, and a removable shelf. 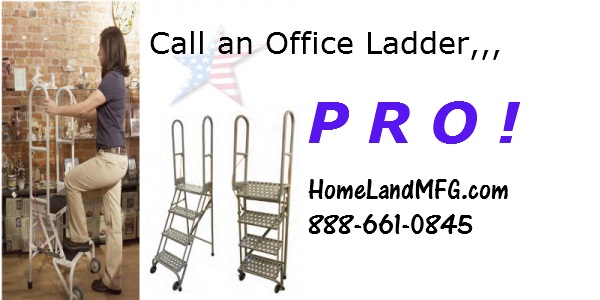 The Office Ladders are powder coated in your choice of eight colors selected to match popular office furniture and accessory colors. The casters roll easily over carpeted areas and rubber matted solid tread or black sandpaper tread is comfortable for all footwear types. 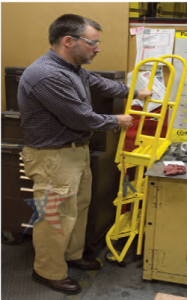 FOLDING ROLLING LADDERS FOR OFFICE, RETAIL, AND INDUSTRIAL USE, EASY TO STORE AND READY TO USE The New Cotterman StockNStore ladder provides an easy convenient means to access shelving or other work areas. 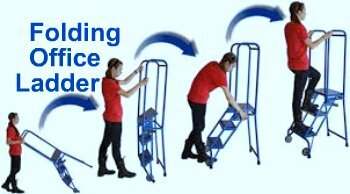 This lightweight ladder easily folds into a compact assembly for quick rolling movement and storage. • Available in 2,3 and 4 step models, all with 16" wide by 7" deep steps and 10" deep top step. • Cable release system for weight activated hinges with no pinch points. • Easily folded in one simple motion. • PVC coated aircraft cable • Rolls in KD form or setup. • Compact and easily stored. • Powder coated in an array of colors. • Available in steel or aluminum. • Three tread types - solid tread with rubber matting or grip strut. • 4" casterswith Delrin bearings. • 30" handrails • Ships parcel freight. Rubber-Tread OFFICE LADDERS feature a 55-Degree slope that eases climbing. All-welded round tube steel construction. Rolls easily on 4 spring-loaded, 3" dia. swivel casters. Rubber-covered 7" deep stair treads. 10" deep top step. Country of Origin Made in USA. 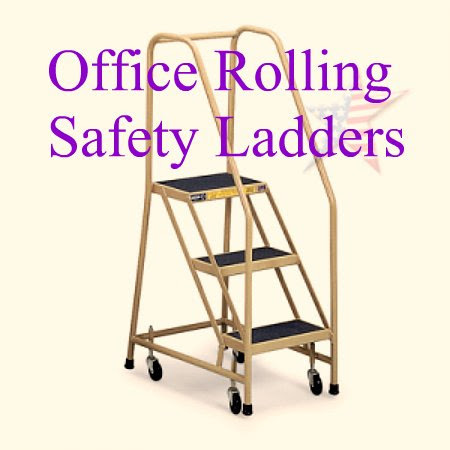 VESTIL ROLLING OFFICE LADDERS, Commercial rolling ladders are an attractive and economical alternative to a traditional warehouse rolling ladder. Sleek design provides maximum safety and convenience. COTTERMAN OFFICE LADDERS look good anywhere with clever tapering design and round pod-like caster covers. Choose from a broad palette of colors to match your office environment or to stand out in the crowd. Treads have black rubber matting or black abrasive tread. All steel construction is an economical alternative to aluminum, but rolls easily across most surfaces. Handrail configurations include no handrails, dual, left, or right side. Choose a shelf or tray for added versatility. Platform dimensions: 16" x 36". A cart to move files or stock to shelves. A ladder allows you to reach your high shelves. 10" rubber rear wheels work well on most surfaces. 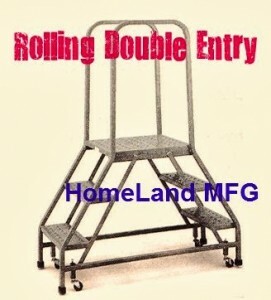 24" width: great for worker passage in narrow aisles. Lockstep Design with two 3/4" wide x 4" high rubber casters in a pedal activated lockstep with rubber tips. Convenient and easy to use. 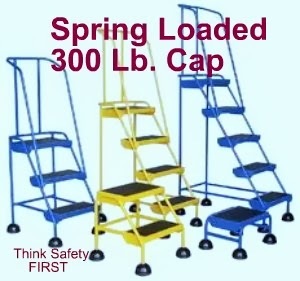 Spring loaded casters along with a rubber ring around the base provide the extra grip needed when being used. Each step includes a rubber surface. Steel construction with powder coat finish. Capacity is 500 pounds. Easily assembles without need for tools. Meets or exceeds OSHA standards.